You asked for it, and Larsen delivered! If you’ve wanted to try all of Larsen’s delicious vegan donuts but didn’t want to get a dozen of each, you can now try all of their varieties in this delicious sampler pack. Each box includes 3 Bavarian Crème donuts, 3 Raspberry-Filled, and 3 Ring donuts, as well as two 6 oz. icing containers, one vanilla and one chocolate. Now you can try all of Larsen’s varieties and both flavors of frosting- we know one will soon be your favorite! $14.99 per box. **NOTE** - As these donuts are freshly made without added preservatives, you MUST keep them refrigerated until you are going to eat them. Please consume these donuts within a week of the time they are received to ensure proper freshness! LOVE the vanilla icing, but am not a fan of the chocolate. Was hoping these would be light and fluffy but the texture was closer to bagels. Ate all 9, unheated, in about 11 days. I’d say the jelly-filled donuts are my favorite from this sampler, but like other reviewers, I would’ve loved to have tried the cinnamon buttercream. These aren’t "sugar bombs" like normal donuts are, which is fantastic! From sr of West Kingston, Rhode Island on 1/20/2017 . These taste just like the donuts I remember having as a kid. Granted I haven't had non-vegan donuts in probably 15 years, but they dates just how I remember! 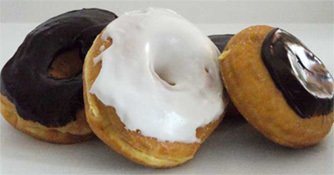 The bavarian creme/boston creme donuts are perfect and taste just like "real donuts." Some vegan donuts can end up tasting more like donut shaped cake but these are the real thing and are exactly what you are looking for if you are craving a donut! This is what heaven tastes like! From China Pop of Crestwood, Illinois on 11/23/2016 . I've searched and searched and searched and finally came across this website. The donuts arrived yesterday and I immediately ate 2 of them. I am thawing another 2 as we speak. They are delicious and I am getting ready to place another order! I'd recommend them to anyone looking for a great vegan option to this delicious snack. From Michelle L of Bellflower, California on 12/29/2015 . I'd given up on assorted when Nutrilicious closed down. WOW how I loved that assortment. Anyway glad we have another, however I'd really LOVE to see them make it an even dozen and for the remaining 3 put in the cinnamon roll with butter cream frosting to try as well. I want to try them and see that I have to purchase 14 in order to do so, so not sure if I want 14 of those or the assortment so I may try the assorted for now. Will review once I've ordered. Can't wait!!! From Lindsey Stone of KANSAS CITY, Missouri on 11/25/2015 . I thawed one of each (let them reach room temp,heated in oven at 300 for 3-4 minutes), applied the frosting, and tried them. I'm vegan, my wonderful bf is not, and after the first bite of a ring donut he said, "It's just like a real donut! It's so good!" We proceeded to split the other two donuts,then I think we sat around smiling and rubbing our bellies for a while. So..I'll probably be placing a monthly order for these.